A drawing tutorial explaining how to draw anything! Drawing tutorial on how to draw anything! This drawing tutorial is going to blow your mind! Yep, as it did mine the first time I tried this drawing technique. I do a few of these drawing exercises every so often so that I don't lose my eye to hand co-ordination, and build on the "in the zone" feeling you get when practices this technique. What is the technique? It's called different names, some call it dual brain, or right side brain drawing. As a child, while playing, and in deep concentration, it would happen naturally, and you wouldn't think about it. Science tells us that "left-handed" folks are the boss at this! As we grow older, ours minds tend to focus into one region or the other to handle certain tasks. This drawing tutorial will show you how to get back into that zone and keep you are operating at a deeper concentration level than you thought possible. A drawing lesson that teaches how to draw anything! Drawing is a learn-able skill that uses the "right" hemisphere (subordinate) of the brain. As a child, during normal development, the left hemisphere becomes dominant in most people (handles speech, movement, "logical" thoughts, math, etc.) The right hemisphere handles cognitive thinking, day dreaming, drawing, and other non-speech modes of communication. In men, the left side can become very dominant. Where studies have shown that most women retain a more balanced use of neuron activity between the two halves (more whole brain thinking). (There I go again calling myself a half-wit). Yes, my wife is laughing at me. The right hemisphere has been proven to handle certain things, but in order to allow R-mode function, the left hemisphere must relinquish control. This is called a shift from L to R mode thinking. This drawing tutorial exercise can be used to help this happen. After training, you will be able to consciously shift from L-mode to R-mode in order to draw or paint or even do other functions that would require more insight, intuition, hunches, or creative problem solving. This is where you can let your creative spirit soar! 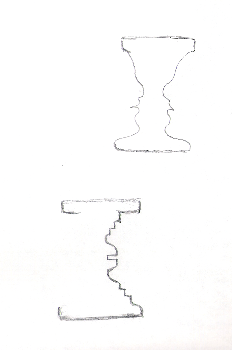 As you move your hand away, you will notice a face, then the second face, and finally at some point a vase will be apparent. Your brain feel funny? It just went into right mode thinking! Step 2. A second exercise in this drawing tutorial involves printing the above image. Step2a. Then taking your pencil, imitate or copy the other half of the face/vase drawing on the bottom. If you're left handed, keep the drawing as shown, if you're right handed, turn the paper around so the half of the vase is on the left. Begin drawing at the top and attempt to copy exactly the image on the left. You are attempting to complete the vase and make it identical on both sides. During your concentration, your brain will go into right side mode. Drawing tutorial, how you can draw anything! Please don't dismiss this as Weird Science. I'll explain further on in the lesson. Step 3. Our third exercise for this drawing tutorial is probable one of the most convincing exercise concerning the right mode theory. And yes, you can use any subject, and any photograph you have to do this. Take a black and white photo of someone you know well. Turn this photo upside down and begin your drawing in this way. Draw exactly what you see. Your drawing will also be upside down. Your L-mode brain will say, "this is nuts" and relinquish control. The R-mode will jump in with both feet to accomplish the task. Keep it simple at first, a picture of an apple, or a salt shaker will be just fine. Don't worry so much about all the shading, just get the major intersecting lines and some main shadows. This exercise is to help convince you that you can do this! As your drawing progresses, you will become engrossed in the process of copying and will begin to forget about time. I've found that when I'm really working well, I feel one with the work, the painter, the painting become one. I feel excited yet calm. Not happiness, but more like bliss. Drawing and painting "in the zone" induces a changed state of consciousness that can last for hours, bringing great peace and satisfaction. I can remember before retiring from industry work, and after putting my kids to bed, I'd go to the studio just to work on a short passage. I'd then notice my legs beginning to ache, and then realize it was 3 AM in the morning, and I had been painting for over 6 hours straight! How's your drawing coming along. Have you completed the upside down exercise. Were you surprised at the results? I'm amazed at how close a resemblance to the photo the drawing usually is! It is an exercise that will prove several things to you. That you can draw and draw well, and being "in the zone" is a nice feeling! Please write me of your experience and attach a copy of your drawing! I may use it with your permission on the website as an example. The really good ones will be those folks that have never done a serious portrait before! This drawing tutorial was derived from notes that I had taken years ago from this fantastic book. 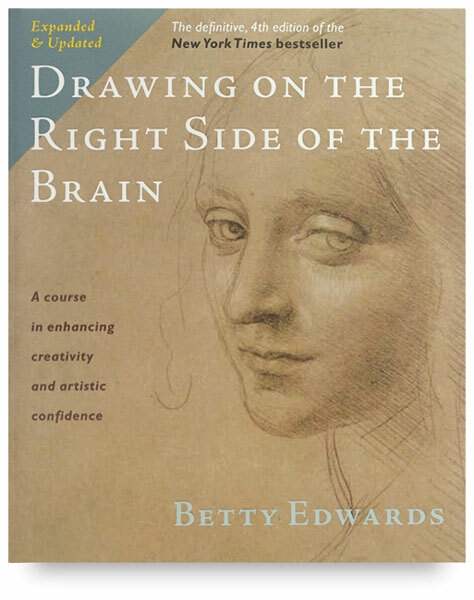 "Drawing on the right side of the Brain" by Betty Edwards. More reference materials, and examples of this wonderful technique can be found here on the official right side drawing website. The link opens a new page so you don't lose your place here!